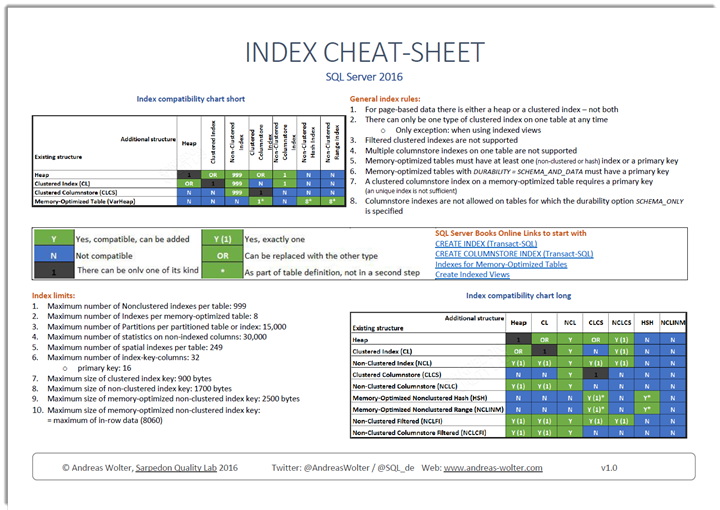 – Not included are: Indexed Views, XML-Indexes and spatial indexes, as well as the implications in Sparse-Columns. I did not consider Unique Indexes separately as for the purpose of my consideration they do not behave differently to the way their non-unique couterparts do. I hope these overviews are a helpful mnemonic device not only for beginners but also for those who don’t always remember every single rule. Links for further readings are listed at BOL. The SQL Server 2016 In-Memory Evolution – from row-store to columnstore to... What makes a successful Tech Conference?